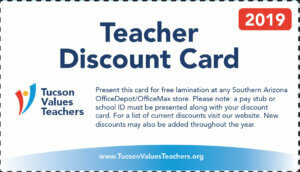 Your contributions help us provide great programs and benefits for teachers. Thanks to the generous donations from sponsors and individuals in our community, here are just a few examples of what these dollars have funded. More than 140 math and science teachers have gained valuable industry experience and earned a master’s degree or professional development credit at the University of Arizona, and more than 94 percent of them are still teaching in Arizona classrooms thanks to our Teachers in Industry program. This program is possible thanks to a grant from the Thomas R. Brown Foundations and past grants from the Freeport McMoRan Foundation and Science Foundation Arizona. Coupled with the wages paid to these teachers for their summer work at Arizona companies, this programs represents a $4.5 million investment to retain high quality STEM teachers for our students. Since 2009, TVT’s Tucson Supplies Teachers campaign has contributed over $880,000 of school supplies for teachers and their students. Your donations in any amount allow us to purchase Office Depot/OfficeMax and Walgreens gift cards that teachers can use to purchase exactly what they need — whether it’s pencils and crayons or computer software and calculators. We host events during Teacher Appreciation Week and throughout the year to recognize teachers and give them opportunities to collaborate, network and socialize with other teachers and community members. Your funds allow us to purchase materials, refreshments and tickets to baseball games, concerts or other events that allow us to show teachers we value and appreciate them. We conduct campaigns and initiatives to empower teachers and give them a voice. Our recent Teachers Vote for Education campaign proved that teachers are active in the political process and turn out to vote at much higher rates than the Arizona electorate. In the 2016 general election, 92% teachers from Marana, Sunnyside, Sahuarita, Vail and Tucson Unified school districts voted compared to 74% of Arizona voters and 78% of Pima County voters.